Mayor Tim Keller and First Lady Elizabeth Kistin Keller participated in the 2019 Mayor’s Day of Volunteer Recognition for Nation Day of Service awards ceremony, where they honored 10 local volunteers at the Albuquerque Convention Center. Awards were given to a range of individuals, groups, and organizations who have gone above and beyond to serve the city of the Albuquerque. The audience of more than 400 people included the One Albuquerque Volunteer Advisory Board, local AmeriCorps and Senior Corps, and members of the public. “We are very grateful for the work that so many people continue to pour into our city. The tradition of service runs deep in our community and we cannot thank you enough for what you do. 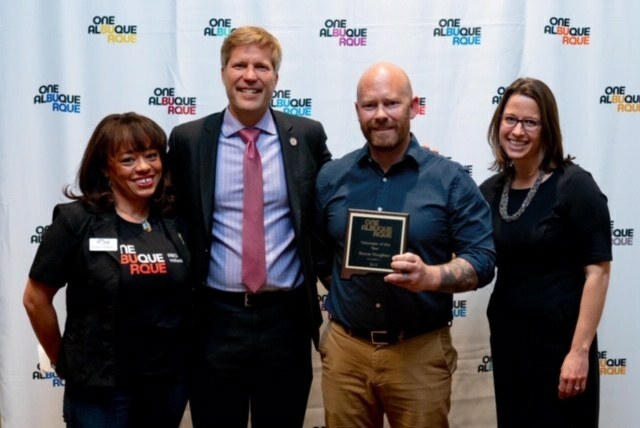 It is your spirit that moves the One Albuquerque idea forward: Only by coming together as one community can we lift Albuquerque up and make it safe, inclusive, and innovative,” Mayor Keller said.